Same Sun Here is an epistolary novel featuring the correspondence between two 12-year old pen pals: Meena, an illegal immigrant girl from India living in a rent control apartment (without the landlord’s knowledge or consent) in New York City and; River, a Kentucky boy from a rural coal mining area. Both first find common ground in their shared love of mountains, but their friendship grows as they promise to always write truthfully as to what their respective thoughts and feelings are. Meena and River are both face challenges in their lives unique to their area: Meena lives a furtive life fearing eviction from her family’s apartment while River’s environment is being ruined by mountain top removal operations that threaten the health and safety of the area’s inhabitants. What Meena and River have in common is having to confront the social injustices that force them into the role of victims. However, as Meena’s parents patiently go through the steps of becoming U.S citizens and River’s grandmother spearheads a grass roots movement to draw awareness to the coal mining company’s devastation of the area, both kids are inspired to persevere in their own ways and find hope in their futures. Same Sun Here is an excellent exposition of commonplace social inequity that infiltrates The Land of Opportunity and how, despite suffocating odds, small actions can provide the force for change. The letters are dated 2008-2009, which places the context of conditions during Obama’s election campaign, victory and swearing-in to office. As such, there is a liberal flavor to the book, though there is no slamming of political conservatism or of Obama’s political rivals. The authors, Silas House and Neela Vaswani narrate their own work. Silas House has a voice that’s a bit too mature to be playing that of a middle-grade student; but his native Kentuckian accent, his earnestness and, the fact that most kids don’t care about the age of the narrator relative to the character, all work in his favor. Neela Vaswami has a girlish voice and her accented English poses no issue in terms of being understood. That said, young listeners may become confused without the visual prompts of the text to be able to distinguish between “Dadi” and “Daddy” and, what sounds like “Missouri” with what is actually “Massoorie.” There are illustrations in the book, but the audio narrative does not suffer for not being able to display them. 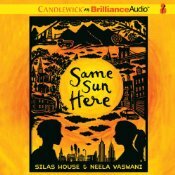 Other Stuff: I purchased a digital dnload edition of Same Sun Here (written and narrated by Silas House and Neela Vaswani) from iTunes. I receive no monies, goods or services in exchange for reviewing the product and/or mentioning any of the persons or companies that are or may be implied in this post. The Cheshire Cheese Cat explores the difficulties of being different, of having friendship tested, of the adversities that individuals face but that ultimately shape character. Skilley has certain traits that are decidedly un-catlike and, his ego in trying to construct and preserve his cat image affects his relationships with others. Evolving self-awareness and reconciling his true nature with his public face show how the individual can change and grow rather than be inhibited by perecived stigmas. It’s easy to make the comparison of Skilley’s social dilemas with the challenges a child might face in terms of self-identity (embracing that which makes us unique) and social interaction (what it means to be loyal and the consequences of betrayal.) The scenes on which these ideas are explored are an opportunity for the child to make the correlation between the anthropomorphized animals and themselves and, require a bit of thoughtful listening. The Cheshire Cheese Cat has an interesting hook to the story in that Charles Dickens and a couple of other literary luminaries of the time make an appearance in the story. Dickens’ himself is given interstitial passages that provide a third person point-of-view to the goings on at the pub. Wilkie Collins and William Makepeace Thackery also make an appearance, though not given voice. Deedy and Wright have also provided some Easter Eggs for those familiar with the mid-19th century authors, e.g.The story opens with the line, “It was the best of toms, it was the worst of times” and we bear witness to Dickens struggling to find the opening lines for A Tale of Two Cities. Given that not many children are familiar with 19th-century authors and their works, these references may go over their heads. There are some gruesome bits in The Cheshire Cheese Cat: Mice are eaten and nearly boiled alive and, the description of rodent infestation (multitude and aroma) were a bit nauseating for those who have experienced the like (see “Mice“); and while the overall feel of the book is not dark, if your child/-ren has/have a sensitivity to descriptions of animal suffering, you may want to be prepared. Katherine Kellgren is the British-American narrator who voices the majority of the novel, providing the world view from Skilley’s point-of-view. The book provides numerous opportunities to show off the narrator’s talent with characterizations; but fair warning: The opening scene sets the tenor of the narrative with a screech and the story is delivered at near-breakneck speed. Robin Sachs, the late British-American actor, narrates the sections from Dickens’ point of view and though infrequent, are nice reprieves from the pitch and pace from the rest of the narrative. 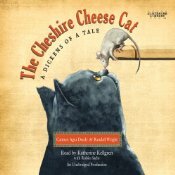 Other Stuff: I borrowed a CD edition of The Cheshire Cheese Cat (by Carmen Agra Deedy and Randall Wright; narrated by Katherine Kellgren and Robin Sachs) from the Jackson County Library System (Southern Oregon.) I receive no monies, goods or services in exchange for reviewing the product and/or mentioning any of the persons or companies that are or may be implied in this post. Check out Heidi’s Armchair Audies review of The Cheshire Cheese Cat at Bunbury in the Stacks! The Phoenix Stone is a fire opal that grants great power, and a great curse, upon the person who possesses it. Cassandra, an aged woman and witch, has it and wants to get rid of it. Grisini, a wizard and puppeteer in London, wants it but can’t get it. Lizzie Rose and Parsefall, Grisini’s apprentices in fantocini, don’t care about it, but are used as pawns in the wizard’s scheme to acquire it. And Clara is the victim of enchantments and a kidnapping plot as her fate aligns with that of the others and to that of the Phoenix Stone. Actually, all of the characters are victims in this tale of intrigue taking place in London, 1816: Cassandra and Grisini are prey to their greed and ambition; Lizzie and Paresfall to the vicissitudes of being orphans at time when poverty and workhouses were common and; Clara of a survivor’s guilt dating back to the death of all of her siblings. Splendors and Glooms is a fantastic tale with magic and thrills and, rich in detail of setting and thought; but it is also a rather dark and sophisticated story. It is ostensibly aimed at children, ages 8 -12, presumably because the story features children in that age range. The story provides a number of opportunities to explore a different time, place and culture. 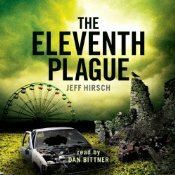 Listeners actually of the target demographic might benefit from the insight of a more mature reader to more fully explain subjects as death masks, memento mori, London fog, child exploitation, cholera, … than is addressed in the book itself. There is also some rather frightening imagery described in the story: witches burning, a lurid monkey-shaped bell pull, a scene in a crypt, a bit of violence and blood… in fact quite a bit more gloom than splendor overall. There is a trend in children’s literature that encourages walking on the dark side, indulging in the more gothic themes that harken back to the original fairy tales, and Splendors and Glooms follows this trend. Davina Porter is the British narrator whose work on this book is irreproachable. Her cultured voice, distinct characterizations, her ability to disappear into the text, mark her as a master narrator. In Splendors and Glooms, Davina Porter voices the POVs of an aged crone, an old, sleazy man, a pre-adolescent girl with theatrical training, an illiterate street urchin (boy) and a little rich girl, all with seeming ease. Splendors and Glooms is a relatively long book for children’s fare, but the narrator’s pace never flagged and was as strong at the end as it was in the beginning. 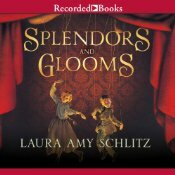 Other Stuff: I dnloaded a digital copy of Splendors and Glooms (by Laura Amy Schlitz; narrated by Davina Porter) from iTunes. I receive no monies, goods or services in exchange for reviewing the product and/or mentioning any of the persons or companies that are or may be implied in this post. 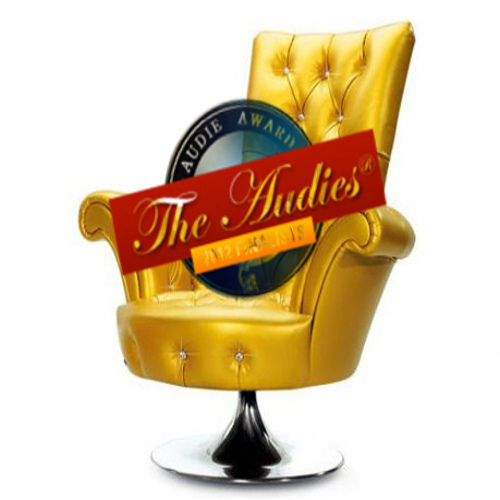 Check out Heidi’s Armchair Audies review of Splendors and Glooms at Bunbury in the Stacks! This was an impulse purchase that somewhat defies my usual listening/audiobook practices in that I have already read and enjoyed the first three Series of Unfortunate Event books and, grittier noir fare is more to my liking. But there it was, in the $5.95 “bin” at iTunes and I thought, “What the heck. 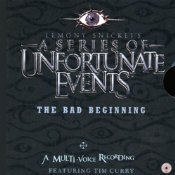 I haven’t heard the multi-voiced version…” For the uninitiated, the Series of Unfortunate Events is about three children who are orphaned and subsequently remanded into the care of legal guardians. In The Bad Beginning, the children encounter their first and greatest nemesis, Count Olaf, who hopes to gain control of the Beaudelaire fortune. 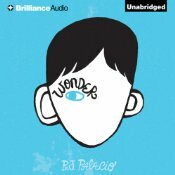 At the beginning of the book and audio, the narrator warns you repeatedly that this is not a HEA tale, and yet I must admit to being somewhat chagrined to realize that the book does not indeed end happily ever after! But hope must spring eternal, as after all, I continue to read more in the series! In the books, the illustrations of Brett Helquist grace the covers and chapter headings. I don’t know what the original medium was, but they give a feel of having been rendered in pen-and-ink and are somewhat reminiscent of Edward Gorey’s Victorian-like artwork. You don’t get the artwork with the audio of course, but the trade off is that you get Tim Curry as the narrator! He has a lovely, smooth, slightly aged British voice that knows how to render the angst and pathos of the story without totally creeping you out. You sense that he is in control of the story and your attention. Harper Audio has cut his narration with some other (uncredited) voices for the multi-voice edition and for the most part everything works. 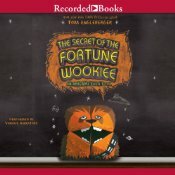 The talent voicing Mr. Poe is wonderfully snuffly and priggish and, with the exception of Mr. Poe’s children, the children actually sound like children (as opposed to adults pretending to be children.) Count Olaf is nasty and oily and the children are precocious without being annoying. The only quibble I had was at the beginning of the production when the sound effects were applied a bit heavily and, there was an odd three-stroke monotone key that was applied at least twice during the story. I have no idea what this sound effect was supposed to be or signify so it was a little bit distracting. Still, all in all, well worth the money. The Beaudelaire orphans have now been remanded into the custody of their distant uncle-by-marriage, Uncle Monty who is a herpetologist. Count Olaf returns to threaten their very lives in a scheme of boldly conceived subterfuge. Lemony Snicket’s brilliance lies within making absurd situations feel real with the tension; his humor; and not only explaining vocabulary words but in applying those words analogously to provide greater comprehension. 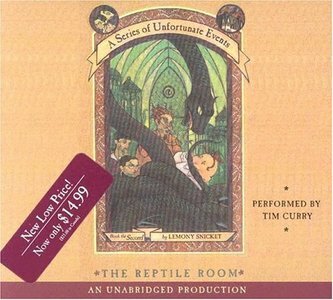 Tim Curry’s voicing of Lemony Snicket/the narrator, Count Olaf and Mr. Poe was fabulous; the kids? Not so much; but overall it was very entertaining. If I did find my attention wandering a little bit, I think it’s only because I did just recently read the book in print and I gave myself permission to think about something else at the less engaging parts. I bought the 3-CD set in 2011 and while it doesn’t include all of Helquist’s artwork from the book, the packaging is pretty nice: The cover matches the book cover, the interior contains a clip of Helquist’s work in the CD beds and there is another graphic printed edge-to-edge on the CDs themselves. If you are wondering why I’m mentioning the artwork, it’s because the quasi-Victorian feel of the illustrations adds to the overall feel of the work. I dnloaded a digital copy of this audiobook from iTunes. 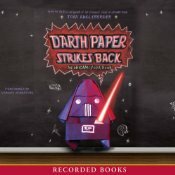 Dwight/Origami Yoda are threatened with expulsion from school after Dwight appears to have threatened another student. 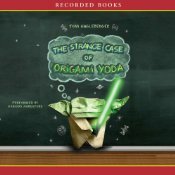 Tommy, who created a case file to prove the credibility of Origami Yoda in the first book in the series, The Strange Case of Origami Yoda, puts together another set of testimonials to show how Dwight/Origami Yoda are actually with the Force. Harvey/Darth Paper serve as the story’s antagonist/s; but not all is at appears, even Harvey! The surprise ending, as well as the story throughout, is fun, funny and clever, though the whole falls just a little bit shy of the brilliance of the first-in-series. Mark Turetsky remains the star of the cast, and my daughter doesn’t care that the rest don’t sound like her classmates! I’ve skimmed through the print copies of the Origami Yoda books and mentioned to my daughter that if she wanted to get the books to check out “Kellon’s” drawings (the illustrations in the book) or the activity pages in the back of the book, I would have no qualms about doing so. I feel like she’s missing out a little bit by not seeing the illustrations, but so she has definitely been entertained by the audio! A fifteen-year old boy and his father are salvagers in an American landscape ruined in a biological war with China. They end up in a suburban settlement which offers them help and safety and, its own risks and dangers as well. The story starts out dark and interesting; but fails to maintain the mood or create an alternate tenor effectively. There are some better-than-average descriptive phrases and the story is not without meaning; it just fails to deliver on the promise of the opening passages. Nonetheless, the narrator was excellent, voicing the young teens, older adults and females without fault.